I have been so excited to share about the wonderful road trip throughout Virginia our family was able to take this past weekend. Why? Because we all need a little inspiration from time to time! Our trip started with a stop in Farmville, Virginia. We went to spend time with another family who has been on the Institutes’ home intensive treatment program for SEVEN years! Joshua, a child with a brain injury like John, has accomplished more than anyone ever thought possible. 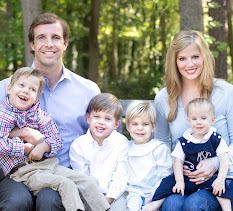 He and his amazing family are our inspiration, demonstrating that all things are possible with the Lord (Matthew 19:26). Joshua works very hard practicing his walking on his "walking square." He has a board between his legs and both walks and grabs onto the "overhead ladder" (like monkey bars) to move forward. It is always a privilege to witness God’s redemptive work making all things new. Joshua’s mother works tirelessly every day, with every single minute planned out, in order to ensure Joshua has every opportunity to reach his full potential. When we arrived, there were four volunteers helping with Joshua’s physical exercises. This dear mother coordinates more than 40 volunteers! Talk about commitment! She has a vision and is simply letting that direct her course. Do you know that feeling: when God puts a dream in your heart and there clearly is no other way? Don’t you just love this passage? Jesus not only tolerates this woman’s nagging in the story but also utilizes her pestering of the judge as His prime example of how we should persevere in prayer and not give up on the causes He has laid on our hearts. Incredible! I am grateful the Lord worked through Joshua and his family to give us a much-needed reminder of these truths. Farmville also happens to be the home of Hampden-Sydney College, Meade’s alma mater. It was surreal for Meade (and me) to be back at this beautiful campus, this time with children in tow! Of course, we had to take advantage of showing the boys my school as well, the University of Virginia. It’s hard to believe I graduated almost 7 years ago and will turn 30 this summer as my little brother (not so little at 6 feet tall!) graduates from high school. Our amazing trip was capped off by two incredible stops in Richmond. We first visited Joshua’s grandfather. Devotion doesn’t come close to explaining this family and their love for and belief in Joshua. Joshua’s grandfather builds many of Joshua’s therapy devices that are prescribed by the Institutes, and he and his sweet wife kindly gave us some of these devices that Joshua no longer needs. Praise God he no longer needs them, and praise God John can use them to continue to develop! Last but certainly not least, we were able to spend a couple of fun-filled hours with our dear friends, Shannon and Hatch, and their three children. Shannon and I have a special “God-connection” in that we were pregnant with our twin boys at the same time and walked through that season together. Then as my world came crashing down, she (like so many of you) carried me and interceded for our family. They are some of our most dedicated prayer warriors to this day, and it was a blessing to have that time with them. The overall theme of this two night, three day trip was inspiration. I stand in awe of the Lord and His tender provision through all of these amazing, godly friends who represent various seasons of our life and different ways the Lord has drawn near. I know that as you read this, you have certain people that pop into your mind as well. Let these people how much they mean to you. I imagine your encouragement will be perfectly timed just as our time with all of these friends was a palpable dose of God’s refreshing. What a fabulous trip! The picture of the four of you on the lawn makes me so happy!